Tampa, (Fl) --- There are several analysis that can be made to Calvin & Hobbes, from the philosophical traces of Bill Watterson to the use of science as a component of the satire. 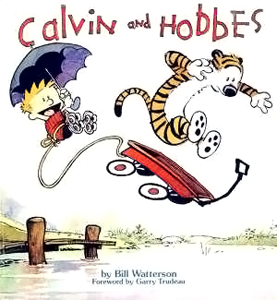 There is not going to be another Calvin and Hobbes and there is not going to be any spiritual successor of this comic, that has been concluded since 1995. It's amazing that's been almost 20 years since Calvin and Hobbes ended, and the comics strip it is still as fresh as it was on November 18th of 1985. It's quite amazing to think how much the world has changed in the last 29 years. Paris is Still Burning and Jenny Livingston went to make television, AIDS is still a menace, the newer generations are focused on more of the sensual pleasures (not to mention, clicktivism) where they ask for anything without even working; school system keeps failing and becoming more intolerant with everyone... The list can keep going on because the topics that the cartoon dealt are still valid, because even with the time people can always find a point to argue using critical analysis. The juxtaposition of Calvin and Hobbes personality goes on practicality vs. impulsive actions; not necessarily old vs. young; as Hobbes if we go on the idea of imaginary friend is just a mere reflect on Calvin's more mature persona but yet with the ambiguity and analysis of relation toward reality. We can think, that Hobbes is just a mere reflection on what Calvin will become, maybe it could be applied towards the Millennials if they learn to look beyond the sensuous pleasures in life and learn how to work their lives out. On one of the story arcs, where the family goes on a camping trip Calvin shows a total annoyance to be in contact with the nature as there were no amenities or technology that he could use; to think the strip had the beginning on the late 1980's and see how a child can't focus his attention because there are no technologies is some of a "problem" that is still seen today, where kids can't see themselves without a functioning tablet, computer or handheld video games. Calvin, is on the point of finding his own cultural identity, there are no points that can relate them to the counter culture movements of the previous ones, there is not a solid ideology and some of the political ideas are related to grassroots waves that create influences because of the Internet weight. Probably Calvin is more keen to Generation X, both generations tend to be interrelated on the use of technology and also to be more liberal on certain ideas opposite to the Baby Boomers. Calvin and his parents could be seen as both generations living under one roof, but yet the depth of his parents was never explored to know if they were more progressive than they looked on-panel; maybe, Calvin himself could be a reflection of his parents ideals on how to deal with reality and with people, even on an intellectual level.